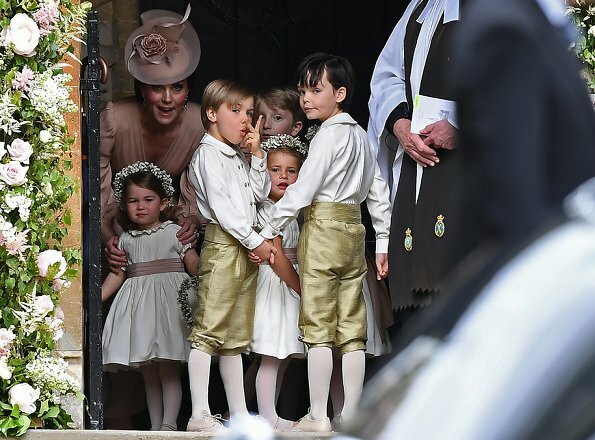 Duchess Catherine, her children Prince George of Cambridge, page boy and Princess Charlotte of Cambridge, flower girl attend the wedding of Pippa Middleton and James Matthews at St Mark's Church on May 20, 2017 in Englefield Green, England. A high neck but I love it! 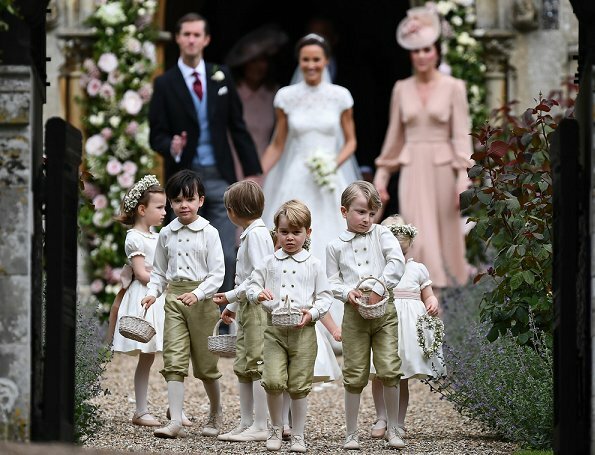 Okay Pippa may have started the next wedding trend! What a happy day. Her niece and nephew are adorable! Love everything! 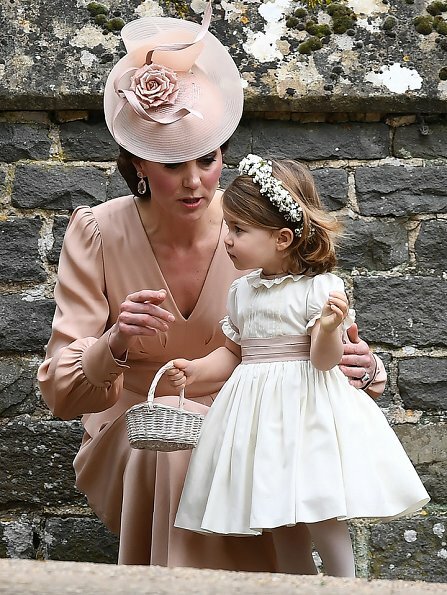 Wedding dress, children outfits & flowers... Also, Kate's hat & dress. 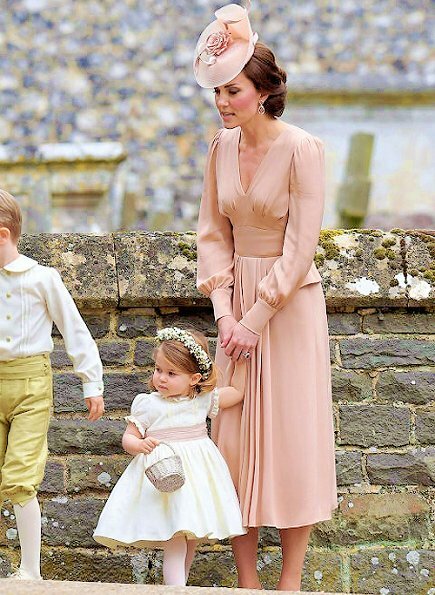 Très jolies robes pour Pippa, Kate et leur maman, très chic. Beautifully done. Perfect gown for Pippa--fitted but still modest. Catherine's dress is lovely--very flattering color to her skin. Children are adorable in sweet outfits. 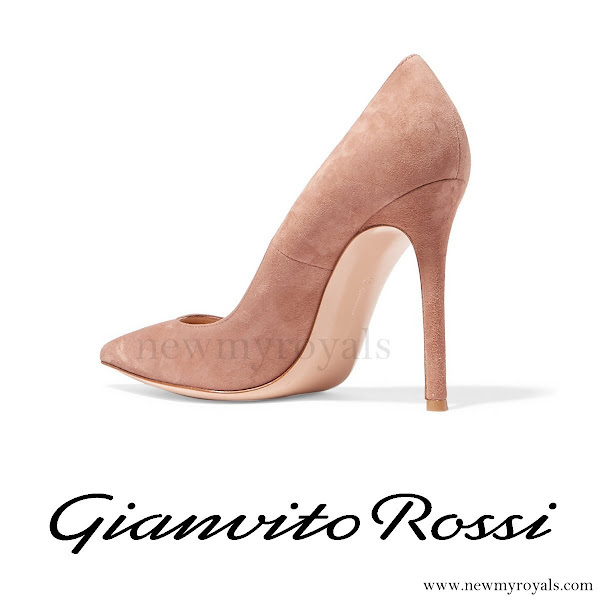 I love the subtle color shifts of the waist details. A very lovely bridal gown! The kids are extremely cute, especially Charlotte. Catherine's dress is nice, but I don't like the boring colour. For once I really love Eugenie's dress although it is too low cut for a church service considering that she is rather well endowed. 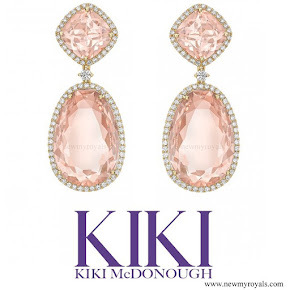 Love, love, love it! All of it!! Beautiful dresses, beautiful colours, beautiful bride! I adore Pippa's entire look. Her hair is perfection and the gown is also really beautiful. I like that she is wearing a small tiara that makes her updo even more elegant and beautiful. Her most beautiful accessory is her smile though. She looks so happy!! Catherine was a beautiful bride as well back in 2011 if only she has worn her hair up just like her sister and just like she did this time. I'm happy that she chose an elegant bun for this event. I love the style of Catherine's dress as well and I'm glad she is not wearing a coat this time. Children look so adorable. The parents must be extremly proud of both of their daughters and James as well. What a beautiful and radiant bride! They make such a lovely couple! 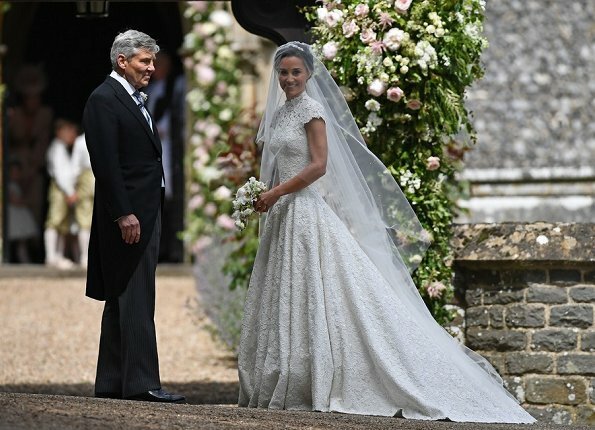 I really like Pippa's wedding gown. It is traditional and romantic gown, and fits her really well. She's in great shape, so no surprise here. 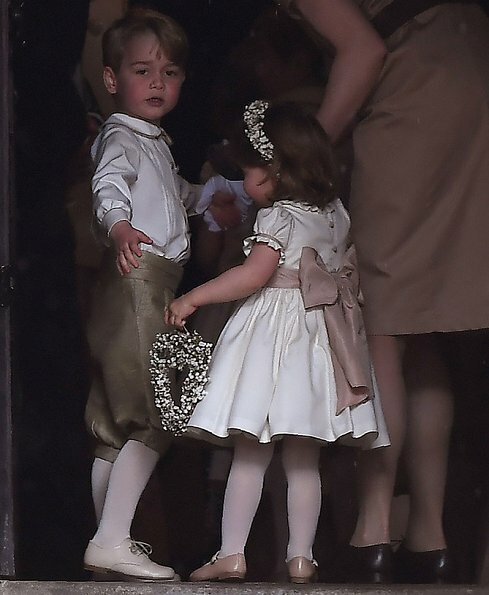 Also loved Kate's appearances and the children looked, ohh, so cute. Even Eugenie looks at her best. Love the wedding dress, in fact I love the bride's whole look. The little bridesmaids and pages look sweet - have go say I'm not a big fan of the shiny olive fabric for the knickerbockers but that's minor. Catherine looks lovely, I like the 1930s/1940s style of her dress and the delicate colour is very nice. Princess Eugenie looks very nice - like the dress and the shoes with the splash of orange and the simple 60s style hat. She's a pretty young woman and it often doesn't get noticed because of what she's wearing. 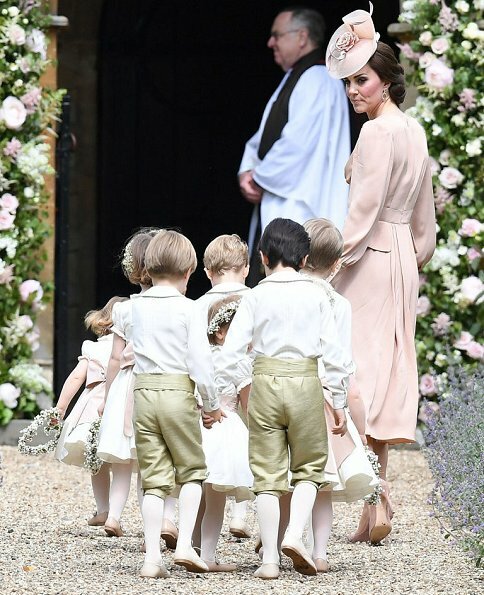 I can't get a good look at Carole Middleton's outfit but it seems to fit in with the general tasteful, spring pastel theme. I was just about to say that the Duchess of Cambridge's dress so much reminded me of dresses once worn by either Queen Elizabeth The Queenmother or the Duchess of Windsor. Very retro, but a great look on her overall. 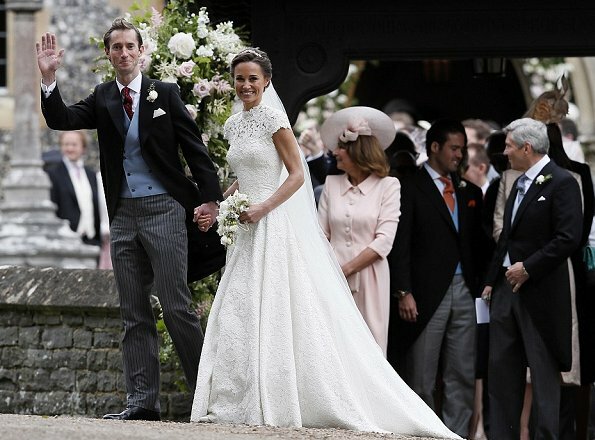 beautiful wedding dress, beautiful style, beautiful Pippa! 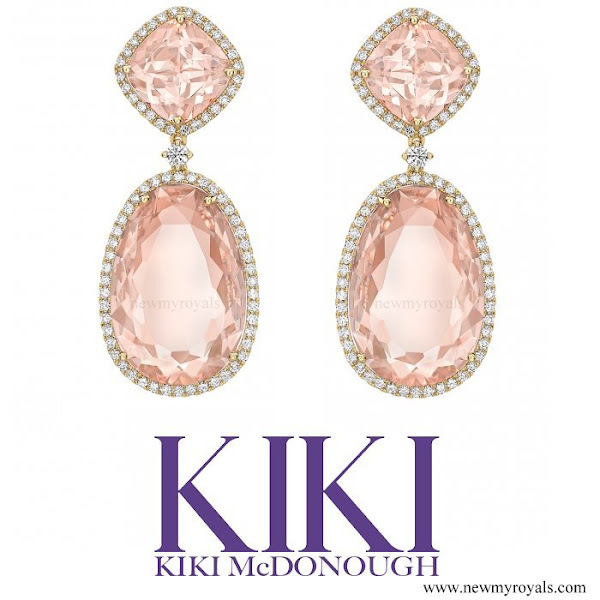 The stylish, chic and sophisticated Duchess of Cambridge. A beautiful bride and adorable children. beautiful gown however the tiara is too small, almost insignificant. flowers would have been better. 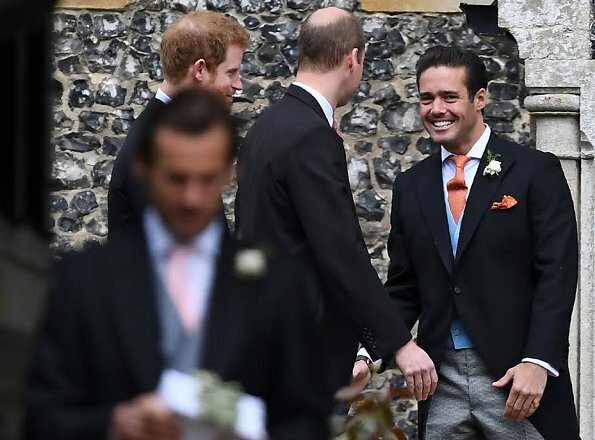 Pippa looks her best in her weddings! Beautiful. I like also Catherine´s and Eugenie´s dresses and hats. Kids are cute as always. Pippa's dress is wonderful, Charlotte and George are very cute and I like Eugenie's dress accompanied with shoes with straps; Catherine looks lovely as ever but I don't really like her dress - the colour is nice but the shape isn't flattering to her IMO. I love Pippa's dress. I much prefer it to the one that Catherine wore. I have always liked a lace wedding dress, lace from neck to hem. Gorgeous. My first thought when I saw what Catherine wore was .... 1940's. Wonderful photos! They all are beautiful. 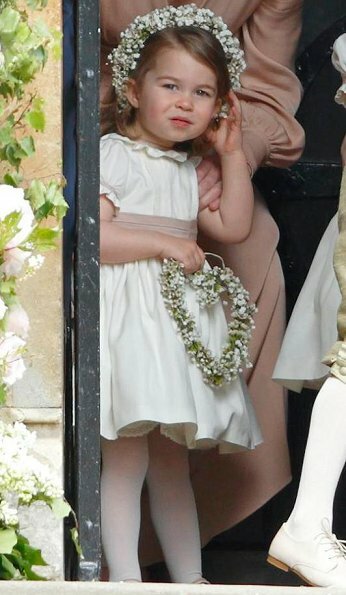 Little Charlotte - so adorable! Congrats to Eugenie, why not always like that? Dress is a bit short. Lovely wedding. Beautiful bride, adorable children. All the guest are very well turned out. Did Harry's girlfriend attended? wie eine Bohnenstange , eher wie eine Gouvernante . Charlotte is just a darling! Everyone looks lovely. I love Catherine's dress, especially the colour. Very very beautiful bride! Superb dress, hair and makeup. Gorgeous. Catherine looks very nice too, love her dress. "1304": Ha ha, I laughed at "beautiful father" :)! But you are right. And let's not forget, beautiful price £££ of the wedding!!! They all look lovely. I love that people wear wedding dresses with sleeves. The children look cute. This is a PERFECTION in every single way! 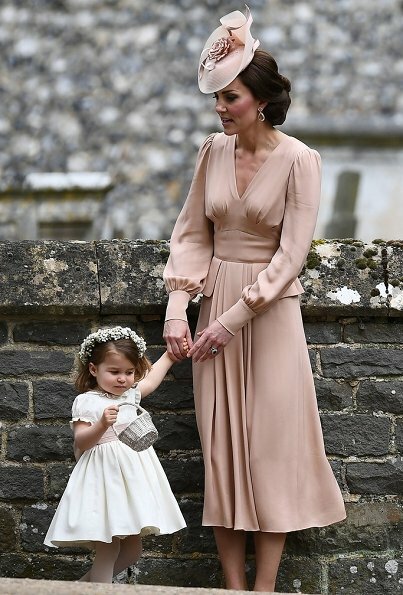 I know Kate wasn't an official bridesmaid (Matron of Honor), but she played the role and also matched her dress color to that of the flower girls' sash. Did anyone else notice this? It's not an exact hue, but pretty close. I don't think that was coincidental. I think it's Kate's way of being an unofficial member of the wedding party. Will look great in photos as well not to clash with the children. The style of the dress requires a long neck and beautiful hands. Pippa does not have this.